March 20, 2016 - On Saturday, a United Arab Emirates Boeing 737-800 operated by Flydubai Airlines crashed killing all 62 passengers and crew onboard. Flight FZ981 had departed from Dubai Airport (DXB/OMDB), United Arab Emirates for Rostov Airport (ROV/URRR), Russia when it encountered bad weather on approach to Dubai Airport. The Boeing 737, which was carrying 55 passengers and 7 crewmembers was cleared by air traffic control for a landing on runway 22. While on approach, the pilot attempted a runway landing, but the landing was aborted. The pilot began to circle the airport until Flight FZ981 entered a holding pattern at about 11:25 PM, local time. Flight FZ981 remained in the holding pattern for two hours at which time the Boeing 737 left the holding pattern for a second landing attempt for runway 22. While on a descending approach for the airport at about 1,500 feet, the aircraft broke off its decent and began to climb to an attitude of 4,000 feet. At which time the pilot set the aircraft up for a landing. The Boeing 737 aircraft began a steep decent for runway 22 when it crashed about 300 feet left of the runway impacting the airport terrain (airport elevation, MSL 259 feet) killing all onboard. The captain of Flight FZ981 has been identified as Aristos Socratous. Reports indicate that the captain was a highly experienced pilot with over 5,700 flight hours. The copilot has been identified as Alejandro Álava Cruz. Upon impact with the ground, due to the angle of impact and speed, the aircraft disintegrated, broke up into small pieces and burst into a ball of flames. One witness reported the blaze from the explosion was so bright it was like having dawn in the middle of the night. Just before the crash, under poor weather conditions, with winds gusting as high as to 50 mph with poor visibility another aircraft had made three attempts to land at the airport with no success. After the third attempt the aircraft diverting to another airport. It has been reported by officials that no distress call had been issued by the pilots before the crash. 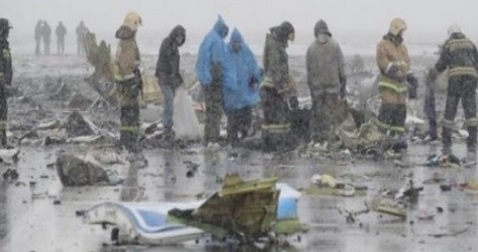 Flydubai Airlines has confirmed that the aircrafts black box flight recorders have been recovered from the crash site by the local accident investigation team and will be analyzed. Reports indicate the Boeing 737 was manufactured in 2011 and had passed a maintenance check on January 21, 2016. Flydubai Airlines reports that there were 44 Russians, 8 Ukrainians, 2 Indians and 1 Uzbekistani passengers onboard Flight FZ981. Russian Emergency Ministry reports that over 850 specialists have been brought in to investigate the crash. Boeing reports under the direction of the U.S. National Transportation Safety Board, Boeing has launched a team that will serve as technical advisor to the investigating authority in charge, the Russian Interstate Aviation Committee (IAC). In accordance with the international protocol governing aviation accident investigations, all inquiries about the investigation will go through IAC. Last few minutes of flight with air traffic control.